Mark Selby conquered the Crucible for the first time by beating Ronnie O’Sullivan 18-14 in the final of the Dafabet World Championship. And Leicester’s 30-year-old Selby produced his best snooker of the match in the concluding session, winning the last three frames and sealing victory with a stunning clearance. He goes home with the trophy and a record £300,000 top prize, which makes him world number one on the new money list. 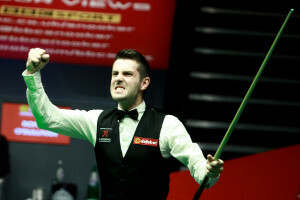 Since reaching his first Crucible final in 2007 – when he lost to John Higgins – Selby has become one of snooker’s most consistent competitors, enjoying previous spells at the top of the rankings and winning the Masters three times as well as the UK Championship. The world title was the one glaring omission on his CV, but he now has his name engraved on the sport’s most famous piece of silverware. The best safety player in the world, he also produced nerveless breaks at key moments throughout the Championship, notably in the deciding frame of a 10-9 first round win over Michael White, and in the last session of his superb 17-14 victory over world number one Neil Robertson in the semi-finals. Selby becomes the ninth player in snooker history to win the Triple Crown of major titles, joining Steve Davis, Stephen Hendry, John Higgins, Ronnie O’Sullivan, Mark Williams, Terry Griffiths, Alex Higgins and Neil Robertson. He was runner-up in both the UK and the Masters this season – thrashed 10-4 by O’Sullivan in the latter – but picked the perfect moment to win his first ranking title of the campaign and fourth of his career. O’Sullivan’s long unbeaten spell in Sheffield came to an end after winning 14 consecutive matches. He was denied the sixth world title of his career, which would have brought him level with Steve Davis and within one of Stephen Hendry’s record. The Rocket, who had won his quarter and semi-final matches with a session to spare, was a huge odds-on favourite for the title when he led 10-5. But he lost all confidence and fluency in the third session, and despite dressing room huddles with psychiatrist Steve Peters, he was unable to regain his rhythm. Trailing 12-11 going into the final session, O’Sullivan started strongly tonight with a break of 100, his 13th century of the tournament. But a missed black on 24 in the next stopped him from gathering momentum as Selby ground out that frame to regain the lead. Runs of 23 and 25 helped Selby gain control of frame 26 and he sealed it by potting the pink after his opponent failed to gain the snooker he needed. And safety errors from O’Sullivan in the 27th gave Selby the opportunity to make 56 and extend his lead to 15-12 at the interval. O’Sullivan took the next in two scoring visits, then made a stunning 37 clearance in frame 29, highlighted by a drilled yellow down the length of a side cushion. But Selby wrestled back the initiative emphatically, making a 127 – his only century of the final – followed by an 87 to lead 17-14. O’Sullivan looked certain to pull one back until he ran out of position at 56-0 in the next. Selby clawed back to within 29 points with one red left. And when his chance came, he proved himself a true champion. A long red was followed by a series of terrific pots, particularly the green which was close to the top cushion, as he cleared the table to capture the title. “It hasn’t sunk in yet,” admitted Selby after winning the final watched by stars including actor Stephen Fry, darts supremo Phil Taylor, Iron Maiden drummer Nico McBrain and Muse frontman Matthew Bellamy. “In the next few days it will definitely settle in. To come through playing Ronnie in the final, it’s a dream come true if you’re going to win your first world title. “At 8-3 down, I knew Ronnie is one of the best front-runners in the world and I was just not playing well at all. I had my chances but kept missing and Ronnie was taking advantage most of the time. A couple of times he missed and I just kept digging in and nicking a few frames. “To get out 10-7 down yesterday, I felt I was winning 10-7. I was physically and mentally tired yesterday – the same as when I got to the final seven years ago against John Higgins. Ronnie outplayed me yesterday and I was still only 10-7 behind and I still felt I hadn’t turned up. “All tournament I’ve felt confident and I knew if I got a chances I felt like I was going to score even though I didn’t yesterday. Ronnie came back to 15-14 and asked me the question, and I probably played my best snooker of the match in those last three frames. “My father passed away with cancer when I was 16, two months before I turned professional, and his last words to me were ‘I want you to become World Champion’. I said to him I will be one day it’s just a matter of when not if. O’Sullivan said: “I want to congratulate Mark on a brilliant match and a brilliant tournament. I tried my hardest but he was just too good. “As a top snooker player you accept the losses with the wins, you can’t have it your own way all the time. I’ve had some great victories here but losing is part of the sport and you’ve just got to accept that it’s part and parcel of it. You have to go away and lick your wounds and go one better next time. “It wasn’t the most free-flowing match. There were a lot of safety bouts and I just got dragged into it. I tried to make something happen and open the balls up a few times but when you’re forcing something to happen, it never quite happens.